1206 10th Street is a 60 unit condominium rental located on the corner of 10th and M Streets NW. The property is located two blocks North of Massachusetts Avenue and one block East of the Washington Convention Center. 3537 11th Street, NW is a 32 unit apartment building located in the Columbia Heights neighborhood. 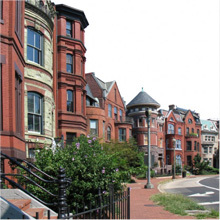 The Columbia Heights neighborhood is a great diverse neighborhood. Over the past few years this neighborhood has seen the development of hundreds of new residential units. 1100 F Street, NE A 24 unit apartment building located on Capitol Hill. This is an older but charming building. Union Station is located 10 blocks West. A Metro Bus line services Maryland Avenue , which is a stones throw out of the front door, and continues to Union Station and beyond. This 110 unit condominium rental has been recently renovated and is located in up-and coming Anacostia. Located only blocks from the new Coast Guard Headquarters and the soon-to-come headquarters for Homeland Security are some of the most spacious efficiencies, one & two bedroom units in the District. Highland Condominiums is a townhome style condominium complex located in Hyattsville, MD, along Route 202. These one & two bedroom units are located minutes from Largo town Center, Fed Ex Field and other stores and restaurants. The Maryland is where hip meets history, where nightlife rubs shoulders with neighborhood. At the corner of two of the District’s most eclectic urban enclaves – H Street and Capitol Hill – these brand new condos are uniquely positioned, elegantly appointed, and unabashedly luxe – with an amenity lineup that features an expansive roof deck and outdoor lobby, to name a few.